If you were asked to identify some of the years, and events, that have shaped history, which would you choose? Compiled by the Whitaker's Almanack team, Chronologica: The Incredible Years That Defined History brings together 100 different points in time, exploring those years and what makes them so special. They've included years and events that should spring easily to mind as well as those that might be a bit more obscure, but which have ultimately had a profound impact on the world. It's interesting to discover just when certain events took place and which others happened to coincide with them. Did you know that the first submarine was built by Cornelius Drebbel in 1620, the same year that The Mayflower arrived at Cape Cod? Or that the Magna Carta was sealed by King John in 1215, the same year that Genghis Khan's army captured Beijing? The juxtaposition of some events is somewhat unusual, like in 1940 when the highlights offered are the Battle of Britain, the beginning of food rationing in Britain, and the opening of the first McDonald's restaurant in San Bernardino, California. Until I read Chronologica I had never heard of the 'sweating sickness' that swept through England five times between 1485 and 1551. The symptoms which began with a headache, were sweat, delirium and a quick pulse, and most people died less than 24 hours after being hit by a headache. In 1517, up to half the English population died of the 'English Sweat'! Another event of interest was the banning of the kilt and tartan in 1746, making it illegal to wear. This was part of the British government's attempts to fight the Jacobites and the law was only repealed in 1782. Perhaps surprisingly, the final year that appears in the book is 1989, the year the Berlin Wall fell, the year of the protests in Tiananmen Square, and the year that Tim Berners-Lee began development of what would become the internet. If you have a history buff in the family, or someone who loves reading about world records or milestone events, this book is likely to appeal. All the information is broken up into short, bite-sized sections, making it easy to read. 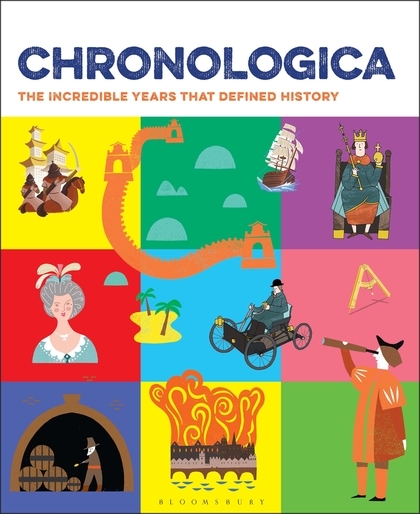 And with minimal illustrations, and almost 300 pages of facts, figures, and historical stories, you really can - and probably will - spend hours poring over Chronologica.